Four towing vessels brought in as insurance after Braer oil spill are to have their funding discontinued. The UK coastline will no longer be protected by the four powerful tugs brought in after the Braer oil spill off Shetland in 1993 as part of the recently-announced Government spending cuts. The Maritime & Coastguard Agency confirmed that it would no longer be providing its four emergency towing vessels (ETVs) from September 2011, saving the government £32.5 million a year. One of the tugs, the Anglian Prince, was the vessel that pulled grounded nuclear submarine HMS Astute from a bank of shingle off Skye where it had become stuck. The MCA said: "Emergency towing vessels are mainly deployed when vessels break down. The government believes state provision of ETVs does not represent a correct use of taxpayers' money and that ship salvage should be a commercial matter between a ship's operator and the salvor." 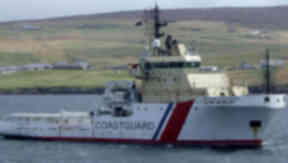 The move was described as "an own goal" by Shetland Islands Council who lobbied furiously in the wake of the Braer oil spill for emergency services that could have prevented that environmental disaster. Shetland Island Council's harbour board chairman Alastair Cooper said that the government was trying to reassure everyone that oil and gas exploration west of Shetland was safe following the Deepwater Horizon spill in the Gulf of Mexico, while removing one of the main planks of its safety regime. "The government is assuring us as a community that everything will be done safely to the highest standards and yet something which we had to make sure we could deal with anything that happened is going to be taken away from us. I can't understand it," Mr Cooper said. "My reaction is one of total surprise and disgust. We are looking to ensure that activity west of Shetland is done properly and safely. This is a retrograde move. "The ETVs are not just towing vessels, they deal with oil spills and now the government isn't going to have a response in the area. It's a bit of an own goal." Four ETVs have been operating out of the northern isles, the western isles, the south west approaches of England and the Dover Straits for the past decade, operated by private contractors Clyne Tugs. They were introduced following the damning report by Lord Donaldson into the risks of the UK coastline being polluted in the wake of the Braer oil spill, which was highly critical of the safety regime in place at the time.